A STEP UP's Sole Sisters, Laura Ditges and Karen Reynolds Dilks, never plan to be a YAWN so continues Season IV of WOW where women inspire women. "Shoe girls are just cool girls" both sisters agree. The summer season allows A STEP UP to coordinate a meet and greet of their clients to one another including entrepreneurs, inventors, healers, creators, etc. Past guests have included make up artists, fashion designers, hairdressers, reflexologists, masseurs, authors, and jewelry designers. 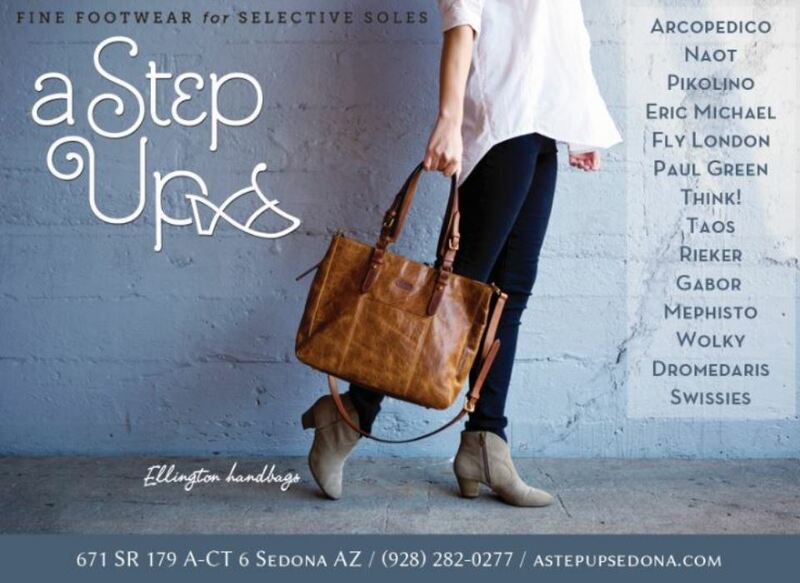 For our clients that would like to plan a get-together at A STEP UP to introduce other women to their products, services or business, on intermittent Wednesdays through the Summer, contactKaren at A STEP UP (928) 282-0277 or email astepupsedona@gmail.com - type in the subject line "WOW". "I have lived in Sedona for 40 years and it's hard to explore all the cool talent in town in busy life schedules... nice to bring the community together. Our store creates happy. ", Dilks continues.